This is Volvo’s answer to the likes of the BMW X1, Audi Q3 and the Mercedes-Benz GLA. 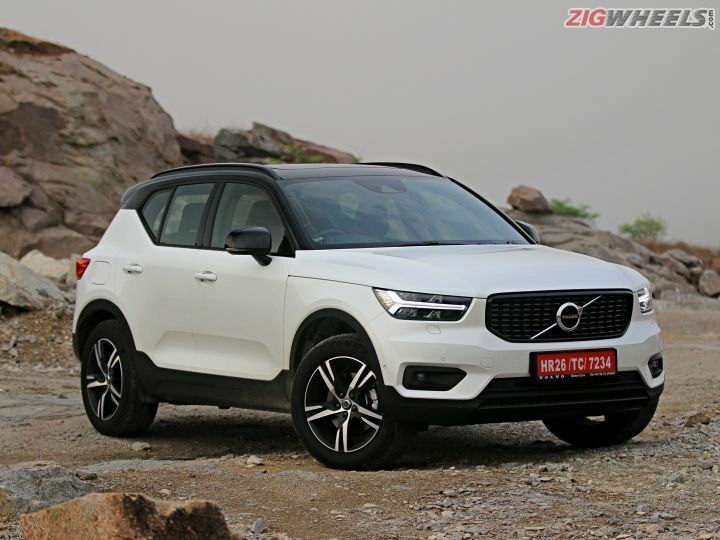 And immediately, there is one simple reason why you could see the Volvo being more appealing to many - it looks like an SUV in a segment filled with car-like crossovers. This was deliberate on the part of Volvo. While the Volvo XC40 is a softroader based on a monocoque chassis like the others in its segment, the design had to be more SUV-like to appeal to more people. The Volvo XC40 screams muscle from every angle you look at it. The bulging hood with a significantly low and visible shut line which extends from the headlights to the front doors, the upright grille, the muscular surfaces on the bumper and the large black cladding give the XC40 a mean look at the front. The grille gets studs to create a unique look among the XC siblings, adding more sportiness to the design. The ‘Thor’s-hammer’ LED DRLs are a signature Volvo design element. The XC40 gets a more compact version of the same. No curves here. Straight deep lines have been used to create that old-school SUV stance. The 18-inch wheels with the fat 235/55 Pirelli P Zero tyres add to the muscular look. There are many design flourishes on the side - from the concave hexagonal bit on the doors with the black cladding flowing below and around it, the blacked out roof, the sharp kink on the rear door and finally the steeply raked windshield. The illusion of small windows continues to make the XC40 look bulky. The signature Volvo waterfall tail lights are present on the XC40, but with its own little twist. The large hatch door, a big spoiler and twin exhausts are the other highlights here. LEDs everywhere on the taillights. They look exciting even when not lighted up. The Volvo XC40 will be offered with only one powertrain at launch. The badge here tells us that it will be powered by a 190PS/400Nm 2.0-litre, 4-cylinder, turbocharged diesel with an 8-speed Aisin automatic transmission and permanent AWD. The XC40 will also be offered in only one trim level - the R-Design. The sportiest looking trim of all, India will be the first market worldwide where the XC40 will be launched in only this top-of-the-line trim. ...one of the jazziest colour scheme we have seen on a car in this segment. The black leather/Alcantara upholstery mixed with you-can’t-miss-it orange contrast elements give the XC40 a very unique appeal. There is an all-black interior to choose from if flashiness is not your style. Minimalism and attention to detail have been combines to create a very interesting looking cabin for the XC40, just like its elder siblings. The highlight of the dashboard is that large 9.0-inch touchscreen infotainment display, picked directly off larger Volvos like the XC60. This multifunction screen lives up to its name. There are very few buttons on the dashboard and you have to get used to control almost everything about the car from this screen. Be it the climate control and seat heating..
...and even selecting the drive modes, everything is done via this touchscreen. It does take some time getting used to it. Also reducing clutter in the cabin is the large all-digital infotainment screen with multiple displays depending on what a driver may want to see. ...and quirky too. Look at the boxy design of the horn pad! The Volvo XC40 is made for the younger generation, possibly with just two people and their small family in mind. Because that rear seat is not going to be a comfortable place for 3 adults to sit side-by-side for long journeys. It’s not just the lack of width and the rather upright backrest angle, the kneeroom is at a premium here. Thankfully two six-footers can sit one behind the other, but that’s about that. The interior doesn’t get claustrophobic. Helped, in part, by the panoramic sunroof. ...a built-in ‘Qi’ wireless charger, with spare space beside it to fit two more smartphones. The front centre armrest folds up to reveal a cavernous storage space with a nicely integrated trash can. There’s also this neat little drawer under the driver seat which can hold items as large as a notebook PC. The rear centre armrest can also hold cups/cans of various sizes. These substitute for the missing bottle holders in the rear door pockets. That is a 586-litre boot. Impressive in its own right, but there is more to it than meets the eye. Including this configuration to hold shopping bags in place easily, those ‘hooks’ are normally part of the floor. The seats fold flat, with a 60:40 split for more convenience. The space under the boot floor could have been even more, but Volvo decided to offer a space-saver spare tyre instead. As stated before, powering the Volvo XC40 is a 2.0-litre, 4-cylinder turbocharged diesel engine developing 190PS of maximum power and 400Nm of peak torque. While these figures are class leading, in line with the BMW X1 M Sport, the power delivery is not explosive. The limitation seems to be the gearbox, which is a bit slow to react to stomps on the accelerator. Everyday driveability and triple-figure highway cruising speeds are easily attainable and maintainable. There is a problem though. The ride. It is a mixture between stiffness at all speeds and bounciness at higher speeds which tends to make the XC40 feel less luxurious than it is. The compact SUV does not get air suspension, instead relying on steel springs all around. Volvo may need to calibrate the suspension for Indian roads if it wants people to absolutely fall in love with it. Apart from that, there is no doubt that Volvo has a serious contender in the compact luxury SUV segment. Volvo claims it will price the XC40 within the segment, but on the higher side. The design, compact dimensions, features and safety on offer should make it a value-for-money proposition, though.